It’s a particularly eventful weekend for Toronto comedy fans, on both sides of the DVP. A little birdie tells me that tickets are still available for Jamie Kilstein’s shows at Comedy Bar Friday and Saturday. Frankly, that’s just plain silly. The show is just $15 if you buy tickets in advance, and if you caught Jamie’s appearance on Conan a few weeks ago, you’ll realize how much of a bargain that is. So seriously, folks: buy tickets. I’ll see you there Friday night. 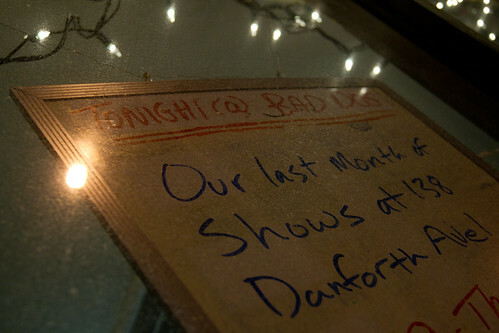 Also this weekend is the last hurrah for the Bad Dog Theatre’s Danforth Ave. location. Here’s the rub: rent was astronomical to the point of being debilitating. Difficult choice. Had to be made. Classes will continue being held off-site, and flagship shows like Theatresports will be moved to other venues such as Comedy Bar. New location for the theatre is TBD, so catch these shows while you can! I’ll be there Saturday, playing house photographer for the evening. Saturday night’s shows WILL sell out. I highly recommend aiming for the 8pm Theatresports, and if you don’t make it in, head next door to the Black Swan. Anne Marie Scheffler is staging her Fringe show Suddenly Mommy for one night only — a night which was booked before the Bad Dog announced its closing weekend. I’ve heard only good things about her, and would be at this show if not for the competition next door. So yes, Jamie Kilstein at Comedy Bar, Bad Dog at Bad Dog and subsequently at Comedy Bar, Suddenly Mommy at Black Swan as an alternative to Bad Dog, followed by a Bad Dog afterparty at the Black Swan. Comedy community synergy? We has it.